In the last post in this series, we configured our two vESXi servers to connect to an OpenFiler storage appliance. This was done by creating a dedicated vSwitch connecting to a Storage LAN. We need to now finish the network configuration to add resilience to our VM network, and add another vSwitch for vMotion. 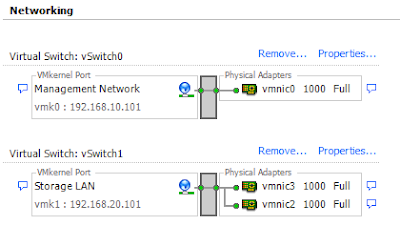 Although we could separate our Management Network from our VM Network (and in the real world, there are some good arguments for doing this), in this vLab, we will use vSwitch0 for both of these functions. vSwitch0 also has a single vmnic which would be unacceptable in a real-world environment. 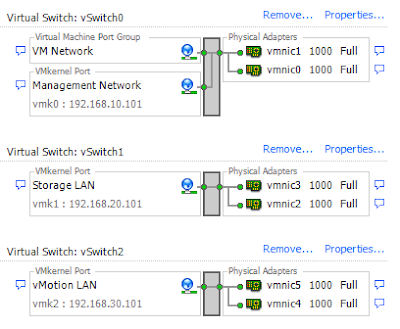 To setup vSwitch0 for VM traffic, edit the Properties and click Add. Select the Connection Type of "Virtual Machine" and complete the wizard with the default options. Back at the vSwitch0 Properties window, select the Network Adapters tab and add the unclaimed adapter that is attached to the same LAN subnet. When this is setup, close the Properties window. Repeat the network configuration on the second vESXi host. The networking is setup and the vLab should be ready for some VMs!